Writing a blog for your business isn’t rocket science. Although it may seem daunting, you’ll find that writing your first blog post is easier than you think. Whether you’re just starting to blog for your business, or you’ve been at it for a while, here are 7 best practices to keep in mind while writing. Find and use keywords that you would like your blog to show up for when potential customers are searching online. Your goal should be to focus on specific keywords that customers will search for when looking for a business like yours. If you want to attract diners looking for award-winning restaurants, write a blog post about the award your restaurant recently received. Use the keyword in the title and URL of the blog post so that your post will show up in searches for that particular keyword. For more in-depth information, read our blog post on keyword research and tools for Google and other search engines. Make sure your articles provide value for your readers. One of the ways that Google decides how much traffic to send to your article is by looking at the amount of time people spend on the page itself. Google will penalize your blog post if it doesn’t hold readers’ attention and they leave immediately (called a bounce rate). A penalty from Google means that your search engine ranking will be affected. Stay on Google’s good side with useful and engaging content. It’s also important to write content relevant to your business. If you write a post on something that doesn’t pertain to your industry, you may attract an audience but not the right audience to your website. Some business owners fall prey to using a service or niche marketing company to write and post content on their blog. While that’s perfectly fine, do your research to ensure the content you are receiving is not also published on another blog. An easy way to check this is to run a Google search of the first paragraph of any content that you buy from a writer or company. Publishing content that is unoriginal and published elsewhere online is bad for SEO rankings. A common scenario seen with business blogging is that business owners start writing and then stop after a short period of time. Keep an editorial calendar and stick to a schedule for blogging. Whether you’re blogging twice or month or twice a week, the most important thing for success is to be consistent. Although you should strive to blog at least once a month as a minimum, it’s also important to recognize that there is essentially no limit to the maximum amount of blogging you do. A blog that hasn’t been updated in a couple of years may lead people that stumble across it to believe the business is inactive as well. As long as the content consistently provides your readers with value, the more blog articles you write, the better off you’ll be. No one likes to read a giant block of text. Make your blog posts easy to read by breaking up the content with bullet points, lists, headers, and images. If your blog post is a list of tips or must-dos, title your post accordingly. 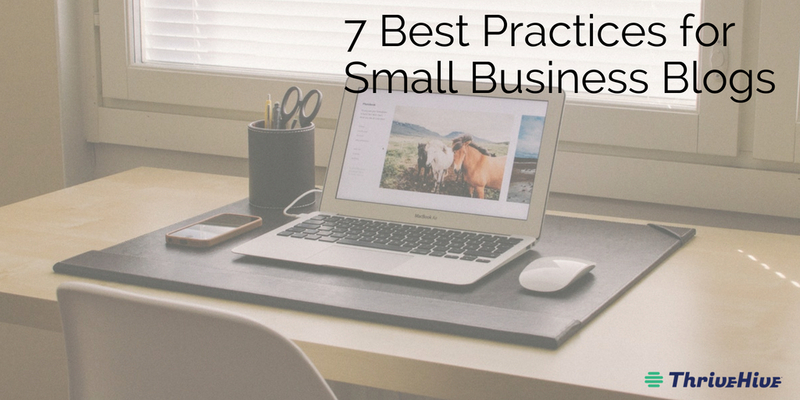 Stumbling upon a blog post with “7 business blogging best practices” presented in a numbered list is more appealing to readers than a long post with seemingly no organization. Long blocks of text may intimidate readers into not spending their time reading your post. This causes them to bounce off of the page. Reduce bounce rate by breaking up blog posts into easily digestible pieces of information. Another way to break up text is by including pictures in blog posts. Images and graphics are visually appealing and keep readers interested. Returning to the example in the first point, if you’re writing a blog post about an award your restaurant received and you’re using targeted keywords for it, definitely include pictures of the award in the blog post! Post pictures of the award ceremony or a party to celebrate the winners. If something is important enough to write about, it’s important enough to take a picture of! Make sure you use at least one image for each blog post or article that you write for your business. If you don’t have any pictures to include, use a free stock photo instead of not including any image at all. Keep in mind also that properly tagging your images with keywords can help to boost the SEO of the blog post to which they belong. Google cannot “read” images, but it can read the alt text (text alternative). The alt text is just one more opportunity for Google to understand what the blog post is about and categorize it properly. Images also have the potential to rank on Google in an image search. .
Don’t expect blog success overnight. Results will take time. Business blogs can help convert more visitors into leads almost immediately because they allow a business owner to show off their knowledge and expertise in the industry. Regardless, SEO takes time which means that it might take months for your blogging efforts to get your business on the first page of Google, and even years to generate large amounts of organic traffic to your blog. This doesn’t mean, however, that blogging isn’t right or working for you. Consistent blogging will pay off over time. Follow these blogging best practices for your business’s blog and you should see results! This entry was posted in All, Business, Marketing, Small Biz, Startup. Bookmark the permalink.